Infusion D’Iris is a fragrance true to its name as the fragrance strength and longevity are pretty much as good as an infusion’s going to get. This is an incredibly light fragrance with a very sad, very short applied life. No wonder a 200ml of Eau de Parfum exists. Having thought it funny that a bottle (not counting fountains) so massive existed at the time, I have since seen the light. I will no longer laugh at your jug’s worth of fleeting beauty, Infusion D’Iris. In Bottle: Green with a slightly earthy quality to it. Dark citrus laid over breaths of earthy, woodsiness. There is a very beautiful,very clear floral in this that lands the fragrance in floral territory immediately. I love the play between the freshness and the earthiness here. The latter often used in a denser way. Applied: There’s a very bitter opener in this that powers through and reserve thoughts you may have had of D’Iris possibly being fruity. Nothing at all fruity about this fragrance as it tells you up front that it means business. The floral is also very quick to come up along with the woods and resins that blend together to make this fragrance sing during the early application period. As Infusion D’Iris ages on the skin the bitterness eases off a little, letting the flower and the rest of the fragrance do its work as it smooths out into a light whitish-green interpretation. Extra: The iris sprouts from a bulb and like most bulb sprouting flowers tend to lack a scent, or have very little scent. There are some iris species that do have fragrant flowers but by and large you’ll find scentless iris petals. So, how come you see some people claim they can smell irises and love iris notes? They probably can because iris absolute does exist. Naturally extracted iris absolute, like many naturally produced ingredients in perfumery, are prohibitively expensive. Iris notes are made from the rhizomes of the plant rather than from the petals like most people would think. It would surprise many to discover that a lot of flower petals lack a fragrance and ye olde iris is one of them. How do they get the fragrance out of iris rhizomes then? They irradiate them then extract the goodness. Irradiation is done to accelerate the aging of the rhizomes to get irones out of them. Irradiation simply makes things faster. Far faster, as aging iris rhizome the natural way could take years, whereas nuking them takes only a week. For the hypochondriacs out there, you cannot get cancer or radiation poisoning from wearing the extract from nuked iris root. You also will not become a superhero. I know. I’m sorry. 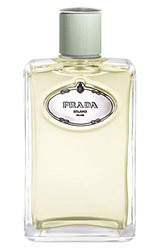 Design: Presented in a tall rectangular glass bottle with the Prada logo embossed on a plate. The cap is a plastic and metal affair with a band of green textured paper running along its barrel. Simple, easy, nothing flashy or complicated. I’m a minimalist by nature so the bottle here suits my tastes. The sprayer is also very decent, even, fine mist, does not distribute too much perfume. Though in this case, it probably should have. Notes: Mandarin, orange blossom, iris, incense, benzoin, vetiver, cedar. Here’s another surprise feature about perfume and supposed expensive ingredients. While there are genuinely expensive ingredients still used in perfume the vast majority of money that a perfume costs to you, the consumer, doesn’t go into the materials to make the fragrance. According to Luca Turin in The Secret of Scent, approximately 3% of the money goes into the fragrance components and development. The other 97%? Packaging, margins and advertising. And so my rage at Burberry Brit’s brick of a bottle continues. Reviewed in This Post: Infusion D’Iris, 2010, Eau de Parfum. This entry was posted in floral, fresh, prada, Reviews By House and tagged benzoin, cedar, d'iris, floral, incense, infusion, iris, mandarin, orange blossom, orris, prada, rhizome, vetiver. Bookmark the permalink.